A new Chinese restaurant called "I Don't Know" has opened in Rochester, New York. The unusually named restaurant was opened by Chinese-American Jessie Dong. She said she was inspired to use the strange moniker for the restaurant because every time she asked her three children what they wanted to eat, they would tell her "I don't know." The I Don't Know restaurant has only two tables and mainly caters to customers who want take-out food. 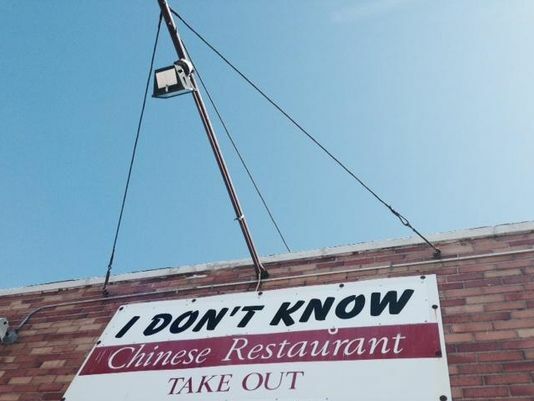 A new Chinese restaurant called "I Don't Know" has opened in Rochester, New York. The unusually named restaurant was opened by Chinese-American Jessie Dong. She said she was inspired to use the strange moniker for the restaurant because every time she asked her three children what they wanted to eat, they would tell her "I don't know." The I Don't Know restaurant has only two tables and mainly caters to customers who want take-out food.